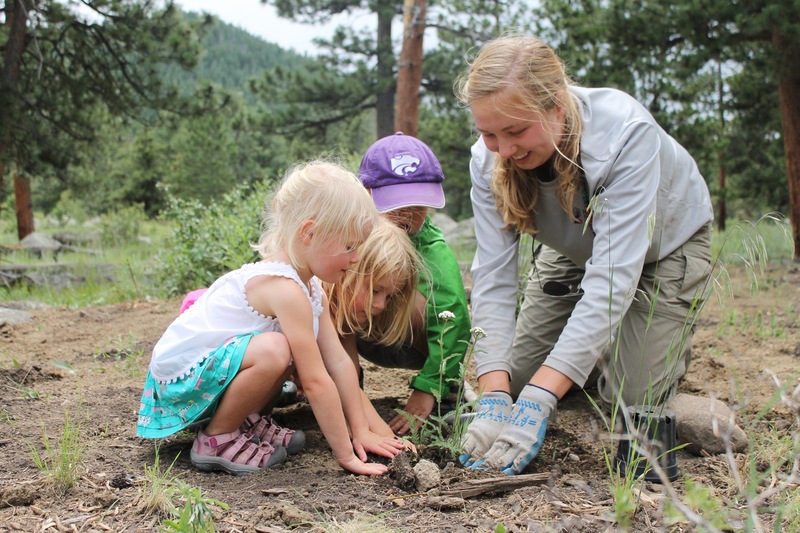 Corps member helps local youth plant native wildflowers in Rocky Mountain National Park. Since 1931, Rocky Mountain Conservancy has provided education and interpretation to visitors of Rocky Mountain National Park as a nonprofit partner. Since then, they have expanded their education programs through their Field Institute and Conservation programs and have identified a variety of ways to engage youth and young adults. This year, the Conservancy is leading programs that engage young people from ages four to twenty-five to learn about the park and become lifelong stewards. Through elementary school programs, fellowship programs and a Corps program, they provide opportunities for young people to learn about the park, protect its resources and be advocates for the park in their local communities. “Our job is to educate the public so that they want to give back to this beautiful place later in life. We feel that it’s important to reach kids so they can develop this love of nature and studies have shown that connecting to the outdoors is good for personal development. It helps them form better relationships with people. Our efforts to engage them are not only good for the preservation of the park, they’re good for these young people as these opportunities enrich their lives,” she said. The Conservancy’s Field Institute offers two to three classes per day during the summer season that focus on environmental education themes. Toddlers as young as four years-old can learn about the park’s insects through the “Bugs, Beetles and Butterflies” program and about mountain lions, coyotes and bears through their mammals program. “When we teach young children, our goal is to introduce them to interesting features of the park and to help them understand the inter-connectivity of the species in this park ecosystem,” Rachel explained. For older children in elementary and middle school, the programs focus on macroinvertebrates, wilderness survival basics and other outdoor skills such as fly-fishing. This past summer, the Conservancy taught over 500 children and were able to offer the classes for free. “We’re grateful to a generous donor last year who helped us fund these classes for children,” Rachel said. “In previous years, we had a price attached to the classes but through this one donor and through the Next Generation Fund, we were granted enough to cover costs and provide these classes at no charge to the children’s schools or families,” she said. 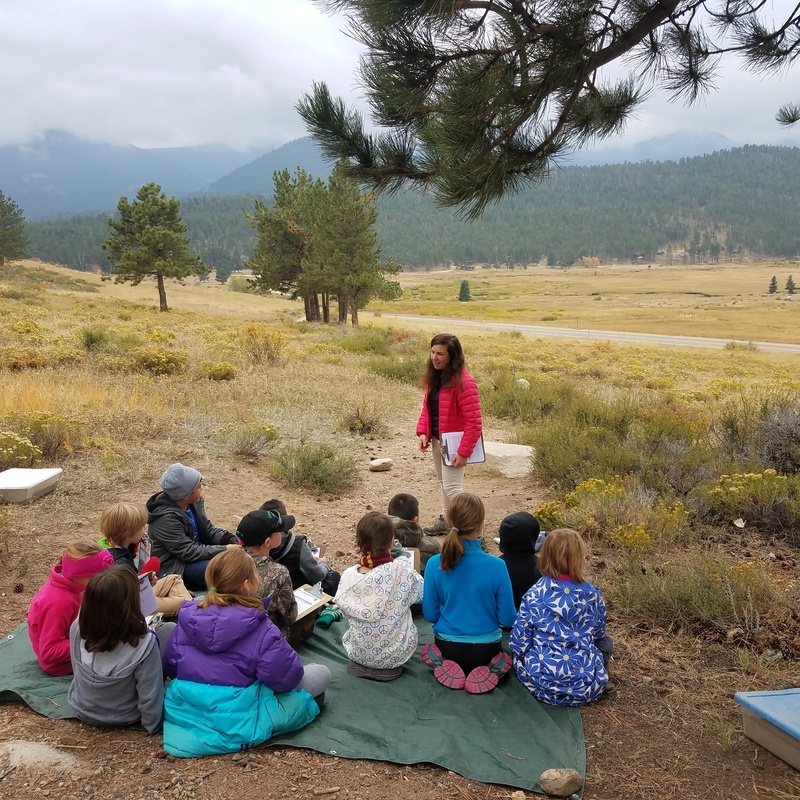 Conservancy fellow leads an environmental education program for school children in Rocky Mountain National Park. Through the Conservancy’s Fellowship program, recent college graduates are hired full-time to work for the Institute and help with education events. These fellowships run from January to May and May to October, and fellows gain experience with environmental education, interpretation and gain a better understanding of the park’s cultural and natural history. In fact, these fellows are trained to lead many of the institute’s classes, providing education to children. “Mentorship is an important part of the fellow program, so having the fellows work directly with children is a great way for them to pass on their knowledge to a future generation while learning more about how to work with multi-generational audiences," said Rachel. High School students, ages thirteen to seventeen take part in conservation work through the High School Leadership Corps. This program, started in 2017, offers a two-week immersive experience for students in Colorado to spend time in the park and complete service projects. “Not only are these students working on field projects in the park and with neighboring U.S. Forest Services sites, they camp in the park for those two weeks. These Coloradoans get to experience the park in ways that most visitors do not,” Geoff said. The Conservancy also offers youth development classes for these students that focus on strengthening communications, how to build resumes, how to perform well at interviews and other career-related skills. For young adults, ages 18 – 24 years-old, the opportunities with the Conservancy continue. Through the Conservation Corps program, corps members from across the country spend eleven weeks in the summer to work on trail restoration, invasive species management and historic preservation projects in the park. Last year, corps members assisted with erosion mitigation projects and recovery efforts in areas of the park that were devastated by a flood in 2013. The corps members have also helped with fire fuel reductions projects to minimize the impact of wildfires. 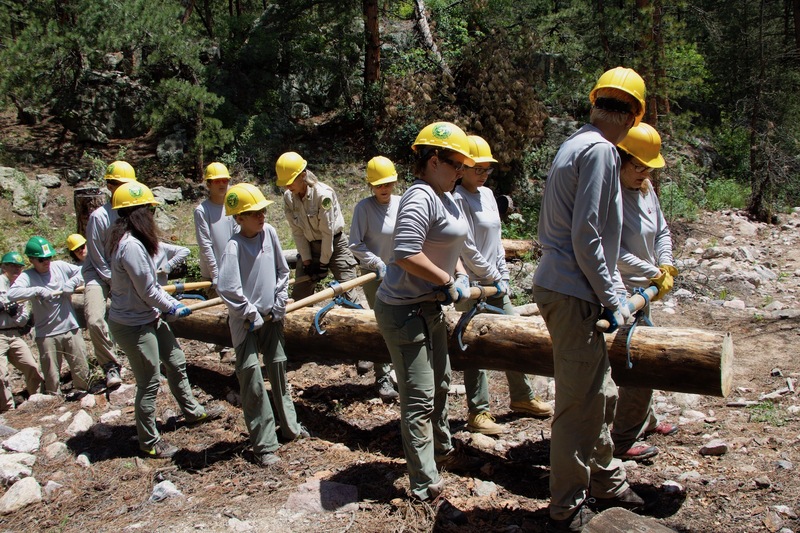 High School Leadership Corps members work together to move log stringers for a wilderness bridge in the Roosevelt National Forest. Project planning and funding requests for youth programs have been delayed due to inability to communicate with agency staff. With uncertainty around when the government will reopen, there are aspects to these programs that will remain up in the air, which could impact program success for months well into the future. Those attending the Rocky Mountain National Park Field Trip at the Public Lands Alliance Convention and Trade Show in Denver this February will have a chance to see the progress that Conservancy Corps members have made in the park. Through Morain Park and along Bear Lake Road, field trip goers will be able to view completed restoration projects and trails built by these members. While the timing of the reopening of the government remains unknown, one thing is certain: the field trip at the Public Lands Alliance Convention and Trade Show will be a unique opportunity to witness a stunning landscape and view completed projects by dedicated young people. Rachel and Geoff both confirmed that winter is a particularly beautiful time to explore the park. “There are less people in the park in the winter which means that opportunities to view wildlife are heightened,” Rachel said. “There’s nothing like seeing the Rockies capped in snow,” Geoff added. Rachel also explained that through the Conservancy’s wide range of youth and young adult programs, young people are not only making a difference in the park for a couple weeks or a season, many of them are entering careers to serve public lands well into their adulthood. “We are always thrilled to see those who attended our Institute classes when they were young or who were part of our fellowship or Conservation Corps programs go on to do extraordinary work for public lands. Many of our fellows now work for partner nonprofits or with the National Park Service. They feel strongly that our programs have helped shape them. They were inspired and now they are excited to give back to these special places,” Rachel said. To learn more about Rocky Mountain Conservancy’s youth and young adult programs, visit https://rmconservancy.org.